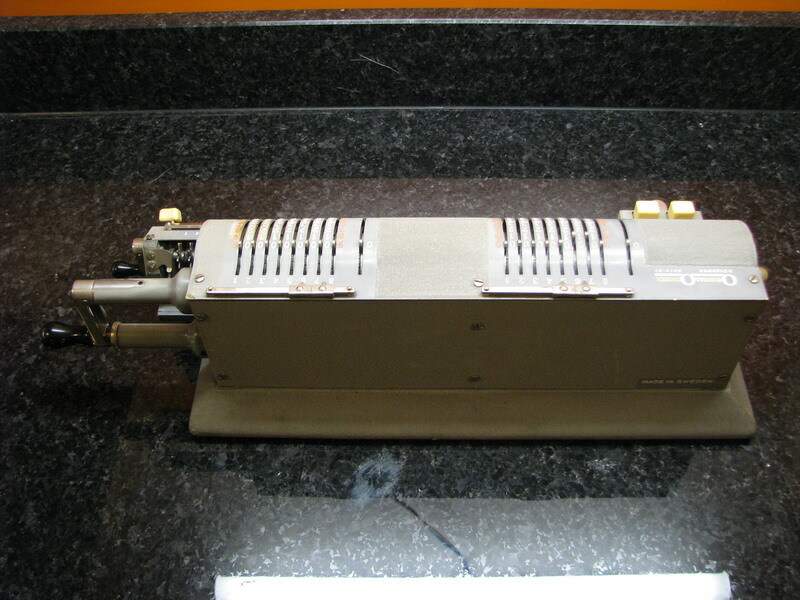 This Odhner is an ebay find, which went uncomprehensively cheap. It is a very special machine though, and well worth some discussion, since I am not aware of an available manual anywhere. 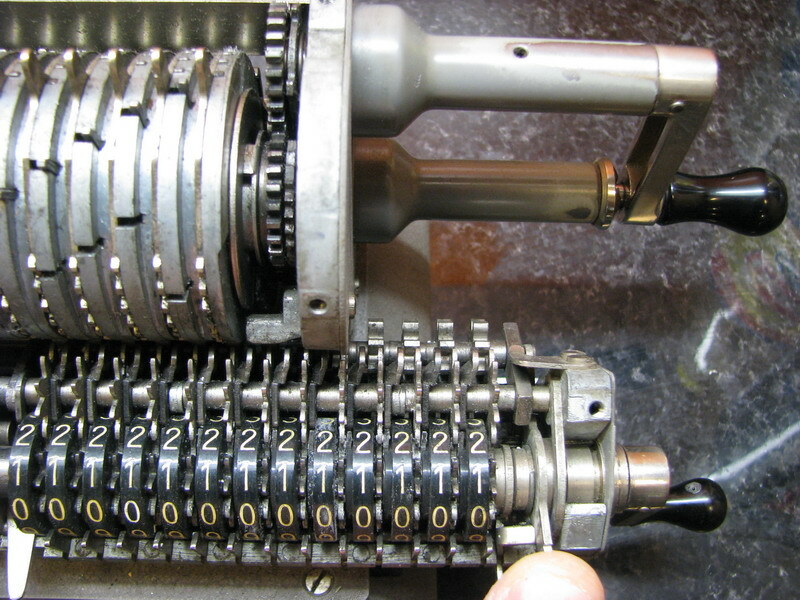 Odhner solved the problem of double machines not by introducing gearing between the pinwheel cylinders to make one rotate in the opposite direction of the other one, but by using complements to effect subtraction in one machine. 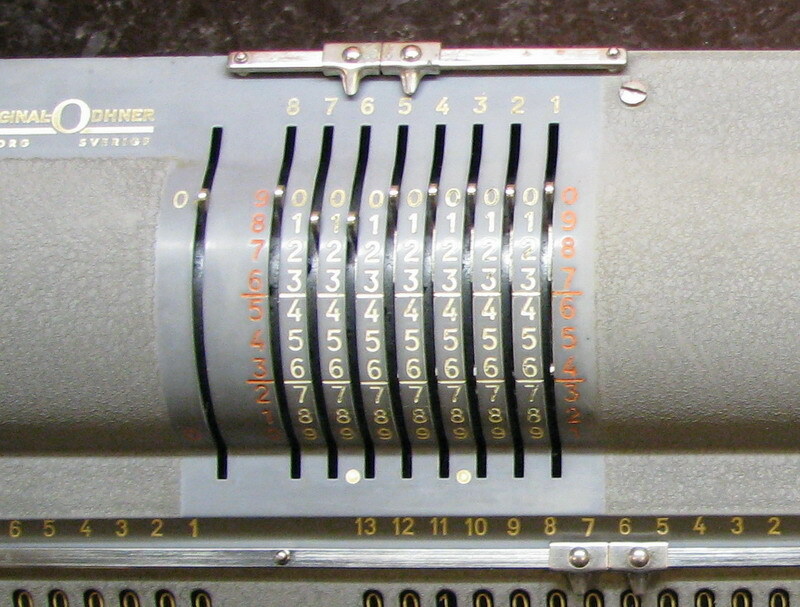 This involves adding all nines to the front of the setting register to tens' carry the leading number out of the register. This is impossible on a regular pinwheel machine, as the result register typically has more numbers than the setting register, but you need to add a nine to every place in the result register, which is impossible. 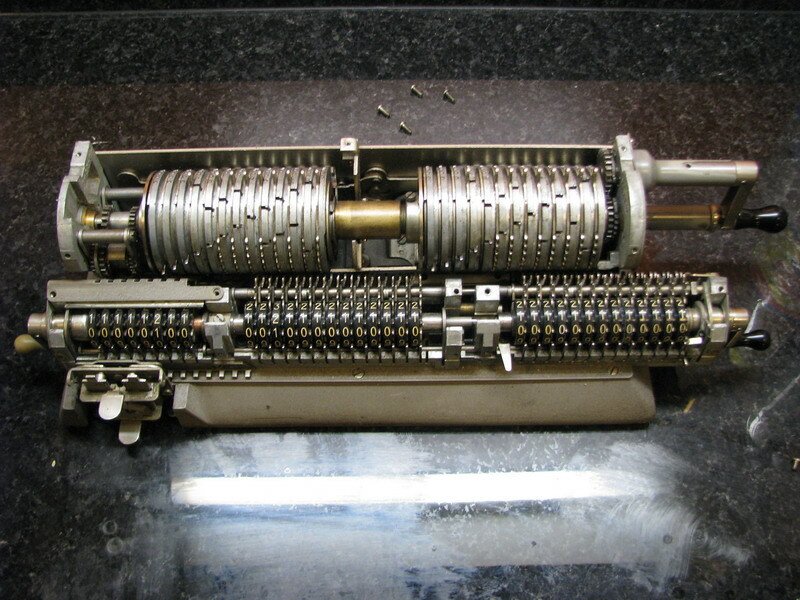 An extra pin takes care of this in the model 35 and 135, operating five pinwheel disks at once, which take care of the leading 9s in positions 9-13 of the result register if necessary. The earlier, black, model 35, could only do this in the left pinwheel cylinder. 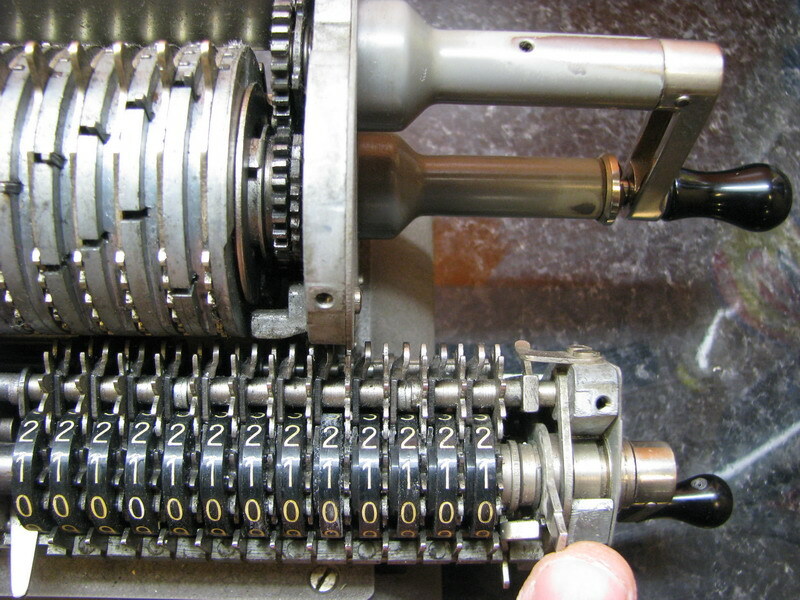 This meant that if you would want to subtract a number from the total on the right, with the right pinwheel cylinder, you had to set the complement of the number to be added in the left pinwheel cylinder, and then crank negatively. This obviously led to much confusion and errors with the operators of the machine, and machines in which the cylinders would be able to rotate in opposite directions (Brunsviga, Thales, ...) were obviously perceived as superior. 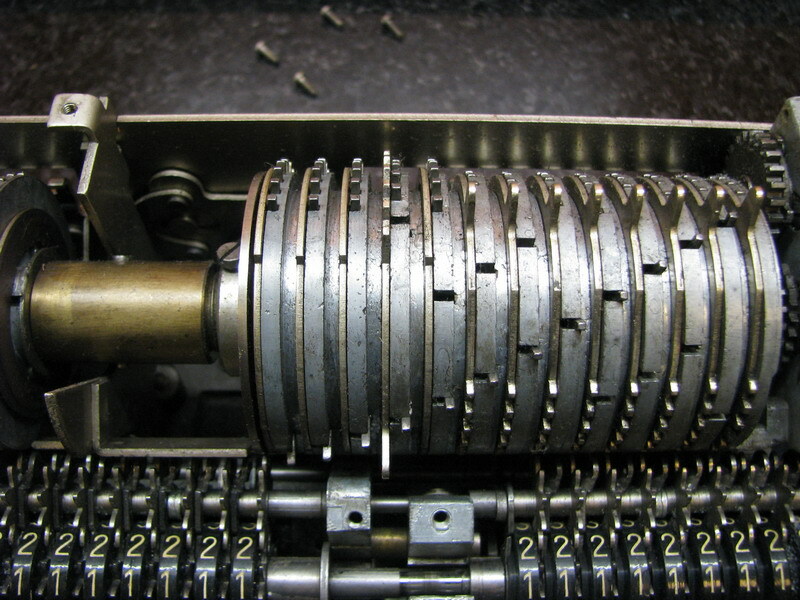 The improved model 135, dating back to 1953 and 1954, solved this problem by providing the extra pin for the leading nines separately on both pinwheel cylinders, making the machine entirely "true to sign" - you could keep track of every sign of every operation by the setting of the machine, instead of having to keep track of it with separate markers or to the side on a piece of paper, and then adjust the rest of the calculation accordingly. With the Odhner 135, you just set into the registers what the assignment said right on the paper in front of you - with this remark that you had to set the complement, using the red numbers in the setting register, if the number happened to be negative (things are never as easy as they seem ...). In other words, 10.000.000 - 231.078 = 9.568.923. 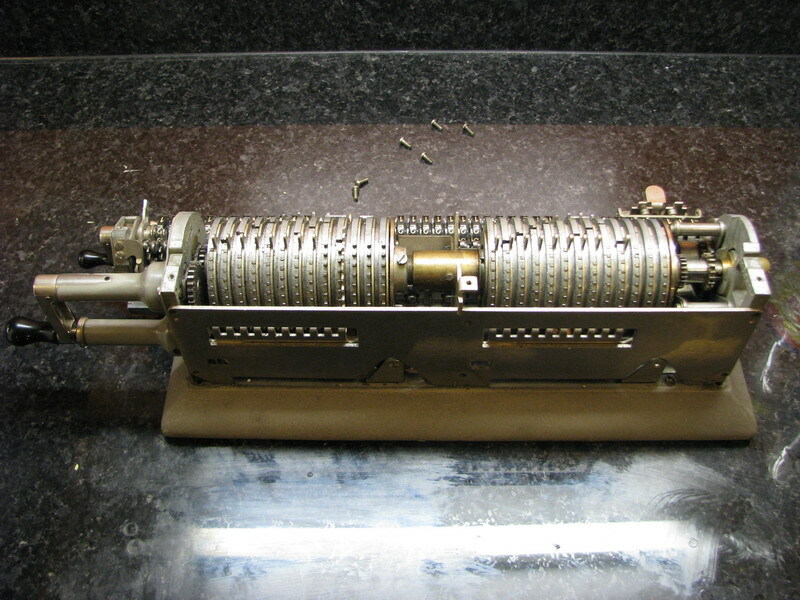 The 1 that got tens' carried all the way to the 14th place in the result register finds that there is actually no 14th digit in the result register, and it carries on into the great unknown vacuum that lies beyond the capacity of mechanical calculators and disappears from our perception. Believe it or not, the computer you are reading this webpage on performs subtraction in exactly the same way, but in binary, which makes things both more complicated, and a lot easier. 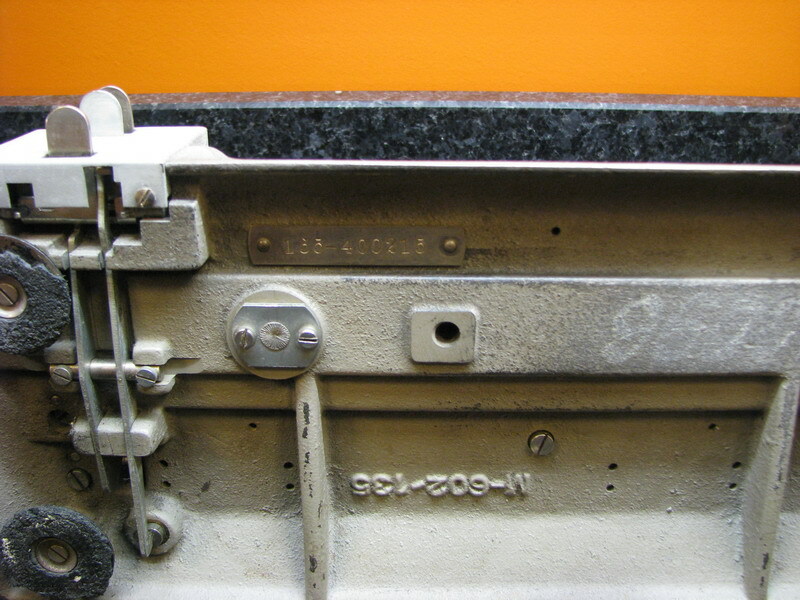 There is also a small mystery lever sticking out of the middle of the carriage. This serves to engage or disengage the operation of the bell. If the righthand machine has to operate with complements, the bell has to be disengaged, as our mystery "1" carries beyond the capability of the register, and the bell is an alert for just that eventuality. It can supposedly confuse (or irritate) the operator while operating with complements, where it would ring at every turn of the crank, so the lever gets pushed to the left to disengage the operation of the bell. For normal, positive operation, the lever is to the right, and the bell sounds if a digit carries beyond the capacity of the regster. The left hand machine has no alert or bell, and thus also no lever for disengaging it in negative operation. 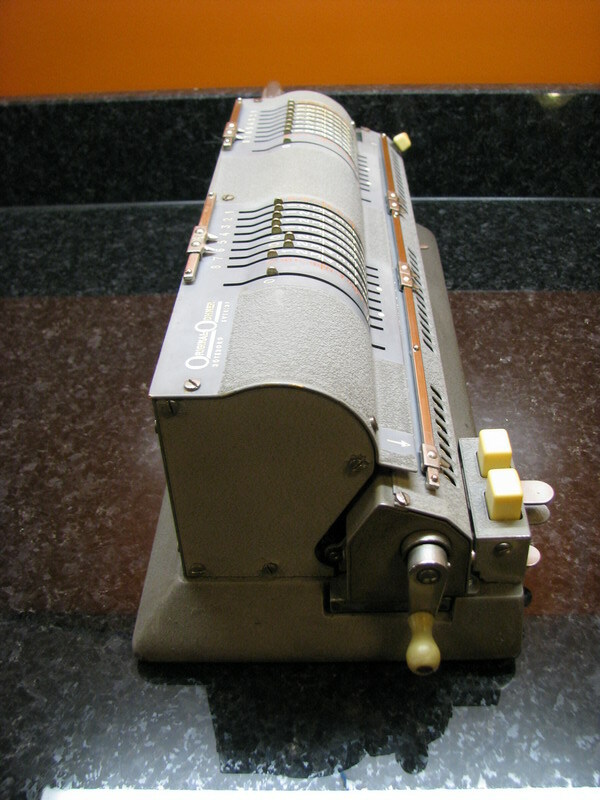 Prof. Wittke, a geometer and a great proponent of double machines (and later of the triple Brunsviga 183) wrote in "Vermessungstechnische Rundschau", 1953, p. 217, that he could not wait to have a single machine that would operate along the same principle. 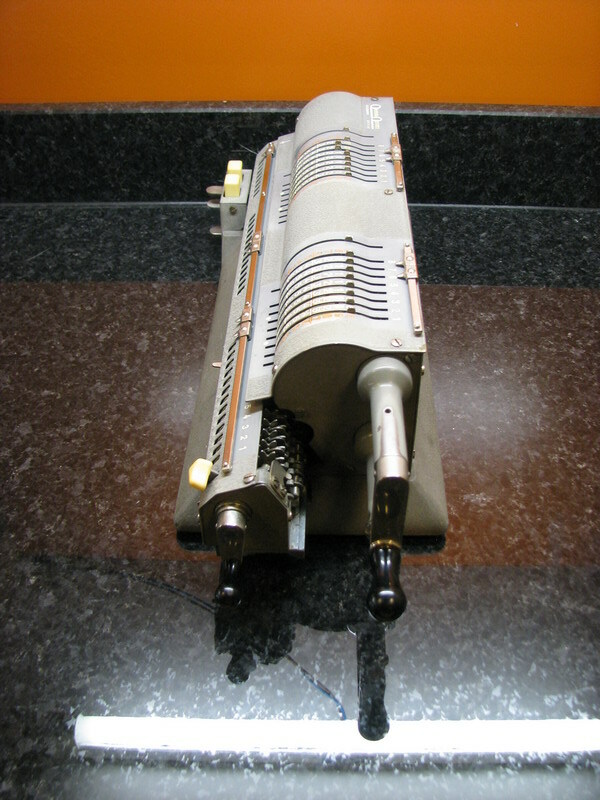 Obviously, the Original Odhner Aktiebolaget never quite agreed, as instead of using complements, without the additional complication of a second machine attached, you can simply crank negatively if you need to subtract. A single machine with this complement system was never marketed. 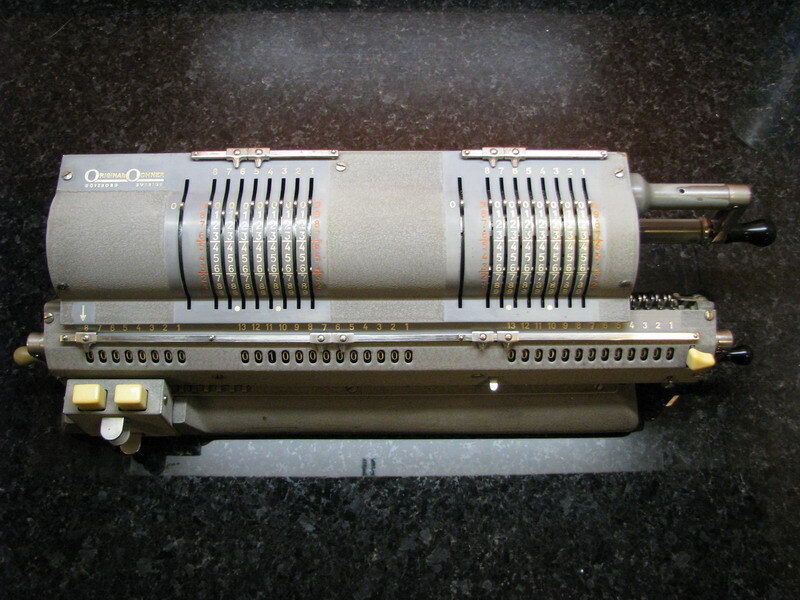 This machine is serial nr. 135-400215, out of alleged total of 406 machines built. I'm very happy to have it in the collection! For an example calculation, see the double and triple calculator page.